Fireaxe is a one-man band in the personage of Brian Voth. The sound of Fireaxe certain falls into heavy metal, although there are other elements present as well. On this CD all of the music is original compositions, but the lyrics are all poems written by the author H. P. Lovecraft (hence the title). The music here runs across a fairly wide gamut but Iron Maiden and King Diamond type sounds are the most prevalent. This is an interesting album only marred by two things. First, the production on the disc is a bit flat and convoluted. Secondly, Voth's vocals can at times be quite rough around the edges. Still, the material here is definitely interesting enough to make this one well worth the time to get through it. 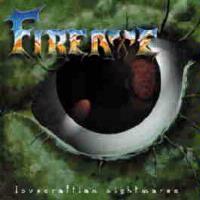 For more information or to order the CD check out the Fireaxe website at www.neptune.net/~bev/Fireaxe.html. An odd, but appropriate tribal segment starts this, then a metal stomp takes the cut. The intro to this features some very tasty soloing. The vocals on the cut feel a bit awkward, but the meaty main riff more than makes up for it, and Voth's frantic guitar soloing certainly doesn't hurt either. Voth's falsetto at the start of this is a bit rough, but the balladic segment that comes in then is quite effective. After a verse in this mode it bursts out into a strong and dramatic metallic fury that calls to mind King Diamond just a bit. It drops to acapella later, then a reprise of the balladic segment returns. It drops from there to just a spoken voice, then burs back up to the King Diamond like territory. This one is very heavy and quite dynamic, eventually dropping back to the ballad style. Spoken words end this. An olde world acapella segment starts this. Voth jumps in with a balladic guitar melody. A guitar solo wanders over the top before his vocals enter here, this feeling a bit like old Rush. It gets rather heavy, but never wanders far. Coming in heavy, dramatic and dark, the intro here feels like prog metal. It shifts gear to a frantic speed metal approach, though. Although Voth's vocals are nowhere near as potent as Bruce Dickinson's this cut feels a bit like Iron Maiden musically. This is another fairly dynamic number and eventually drops to a strummed slower segment. It jumps back up later to the Maidenesque jam with a vengeance. A false ending leads to a reprise of this same section. A garagey early Rush mode starts this, and a nice vocal harmony arrangement marred only by some weakness in Voth's vocal performance, is a nice touch. Heavy flourishes punctuate the verse segments here. A heavier bridge with non-lyrical vocals is a nice change of pace. This ends in a slightly rough acapella section. A great balladic mode with dark and mysterious tones, aided by whispered vocals starts this. The cut gradually builds as the actual vocals enter. This mode runs through the first 2 and a ½ or so minutes until it bursts forth in metallic fury again feeling a bit like Maiden. Voth's vocals are stronger here and he has some very tasty guitar fills. This wanders into a more plodding metallic zone later, very heavy and doom like. Percussion with weird vocals start this, then frantic jamming again feeling like both Maiden and King Diamond takes the piece. This is very dynamic and just a little hard to follow. Based on a keyboard line, the vocals come in here in a dark but mellow mode. It runs through in this style for a time until a new hard edged segment jumps in again a bit like Iron Maiden. It eventually drops back to the mellower mode for a time before jumping back up to the fury. It repeats this pattern one more time before it ends. Starting in a sound that is kind of a cross between a weird progressive rock and Judas Priest's "Dreamer Deceiver", this one builds very gradually. It doesn't wander far, instead remaining a mellow, but somewhat spooky cut. A Mike Oldfield type sound starts this and runs through for a time, bouncy and echoey. Voth eventually builds on this and creates a balladic experience from this basis. His falsetto comes across a little harsh at times. This balladic section combined with that Oldfield like section makes up the first five and a half minutes of the piece. Eventually a guitar solo comes across the top, heralding a movement in new directions. This mode is a flanged sounding prog rock type sound with the solo continuing its run over top. After a minute and a half or so, this gives way to a crunchy take on the earlier mode, essentially the same song, just turned more metal. After another several minutes of building a new guitar solo enter, this one quite noisy, but still meaty. It then shifts to a new melodic section build on waved of flanged noisy guitar feeling a bit like a garagey take on early Rush. It drops to the mellower first verse section later to carry the song to its conclusion. This epic piece is by far the longest on the album.